Today’s book promotion comes from Chris Kohout and his book called Einstein Must Die! If you like Sci-fi/Steampunk novels, take a look below. You might just find another book for your “to read” pile! 1910 AD – Impending war with England has given Nikola Tesla the chance to build his dream: a weapon to end all wars. The American steam-powered Beowulf tank is larger than a house, and carries enough firepower to face an army. Beowulf also has a mechanical brain, embedded with the consciousness of Colonel Browning, America’s best military strategist. But in England, King George has put Albert Einstein to work for his own war effort: zeppelins capable of reaching the former colony, and new, radiological bombs to remind them of the price of disloyalty. When two brilliant pacifists wield technology to bring peace to a planet at war, the final outcome will surprise them both, and the world. Q: You wrote three screenplays before writing your first novel. What inspired you to switch? A: I love the screenplay format. I tend to create fairly cinematic scenes, and those work great for screenplays. But since a proper script contains only what the camera can see, the format is very limiting. Any thoughts inside a character have to manifest as something visible, or they’re cut out. I wanted to explore my character’s minds more deeply. A: Nikola Tesla was such a fascinating man. He invented many of the technologies we use today, but he had a blind spot for business that ultimately hurt him badly. I thought it would be fun to give him the hero treatment, which set things up nicely for Thomas Edison to be the villain. Q: What is it like being a author? Do you enjoy it? A: I love it! Being able to create something out of nothing is really satisfying. And to share your creation with others and have them get enjoyment from it? Awesome. Q: In Einstein Must Die, it seemed like Madelaine was your favorite character. Am I right? Was there any special connection there? A: Nice call! I do have a young daughter, and I thought of her often as I was writing Madelaine’s scenes. I’m sure some of that fatherly love comes across. 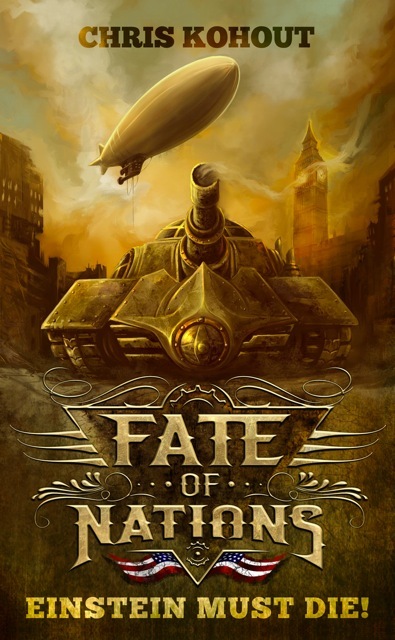 Q: This is the first book of your Fate Of Nations series. What can we expect in the future? A: I wanted the series to have a wide, epic feel. So there’s a lot that gets set up in this first book, but not fully explored. How the war will play out on a global scale, for example. How Madelaine will adjust to her new life. Each book will have a primary focus on one historical figure. This one was Tesla, but the next will be Jack Daniels. Q: Will that be your next book released? A: No, I’m wrapping up now on my second book. It’s a science fiction book called Lawgivers. Law enforcement has evolved and been given new powers to more efficiently deal with crime. Attorneys are judge, jury and executor in one. Police officers are free to investigate and apprehend at will. Working together as a pair, they are called Lawgivers. When a young girl stumbles into their office after witnessing her father’s murder, attorney Sarah and her cop partner Robert seek the murderer but soon find they’re on the trail of a vast conspiracy that revolves around a new drug that vaccinates against all genetic diseases. Going up against its creator, Integrated Life Sciences, would be the case of a lifetime. But against ILS and its shadowy backers, even the law offers little protection. Q: Sounds great! Tesla came across as quite the eccentric genius. Will he be back? A: He won’t be the main character, but yes, definitely. Q: Did you do any interesting research for this novel? A: Quite a lot, actually. Even though it’s an alternative history, where things don’t play out as they really did, I wanted the details to feel real. So I learned a lot about all sorts of things. The internal structure of zeppelins. Naval warfare tactics in 1890. All about the lives of Tesla, Edison, Mark Twain and Winston Churchill. For the town of New Haven, CT, I found the census records from 1910, complete with hand drawn maps of the city. It was quite fun. Q: Do you plan out your scenes before writing? Or do you tend to just create as you go? A: I’m a planner, but it’s important to leave enough breathing room for inspiration to strike. Before getting started, I’d map out the major points I want to hit, but I left a good bit open in between the main beats. I’m glad I did too. It would be really easy to get halfway through and only then realize something wasn’t working. Q: It’s a striking cover. Who made it? A: Thank you. I found a Serbian artist, Darko Tomic, who took my general ideas and made them real. Since Tesla was Serbian, that was a nice connection. Tesla is a hero in Serbia, and is on their currency. Darko sent me their equivalent of a US $10 bill with Tesla’s face on it. I have it framed over my desk. I want to thank Chris Kohout for allowing me to promote his book on my blog. I hope this post has inspired you to go out and read Einstein Must Die! This entry was posted in promotions and tagged Book Hostage, book promotion, chris kihout, Einstein must die, fate of nations, science fiction, steampunk. Bookmark the permalink.